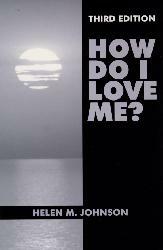 This excellent book on self-esteem grew out of the author's many years of successfully teaching people of all ages and walks of life how to aquire a high level of self-esteem and how to keep it. Ms. Johnson's experiences as an elementary school teacher, high school and college counselor, lecturer, consultant and workshop leader have been drawn upon to develop this readable and practical "how to" book on self-esteem. High self-esteem is an overall feeling made up of many positive thoughts and feelings about yourself. It is an assured, contented, confident, relaxed feeling of knowing that you are capable, worthy, loveable, significant, respected, competent, effective, and all such adjectives which convince you that you measure up! That's a super feeling to have; and as the result of that glowing feeling, you view life as conquerable and enjoyable. The opposite of feeling full of self-esteem is dreadful! To view yourself as inept, useless, unlovable and insignificant is painful. In addition, it's unproductive. We cannot be happy if we do not like ourselves; we feel inferior, unwanted, insecure, unloved. We can never become self-actualized when we have those negative feelings. In order to succeed in anything, a person has to believe that he or she can succeed. If you see yourself as a failure, you will become one. Therefore, I believe that self-esteem is the most important possession one can have. The person who has self-esteem is rich-in the best sense of the word. And it is within reach of everyone-rich or poor, young or old, sick or well, male or female-everyone! This dynamic inner force allows and motivates you to be the best you can be. That's important, for you are unique; there is only one of you, now and forever more, on this earth. You are special; there are things you can do that no other human being is capable of doing. You can develop and grow to your full potential if you feel good about yourself. And you will feel accomplished and proud of yourself if you work and develop to your full potential. Chapter 1 - What is Self-Esteem? Chapter 2 - Where Does Self-Esteem Originate?